Welcome back to the UNofficial Photoshop Olympics. It's Day 3 and the event du jour is ARCHERY. Who knew that pointing a lethal weapon at a dog target would be considered an Olympic sport! I'm IN. I have excellent eyesight. Did you know that cats have the largest eyes (proportionately speaking) of any meat eater? Say a prayer, Fido. Everybody else calls it a bullseye. *I* call it something else. 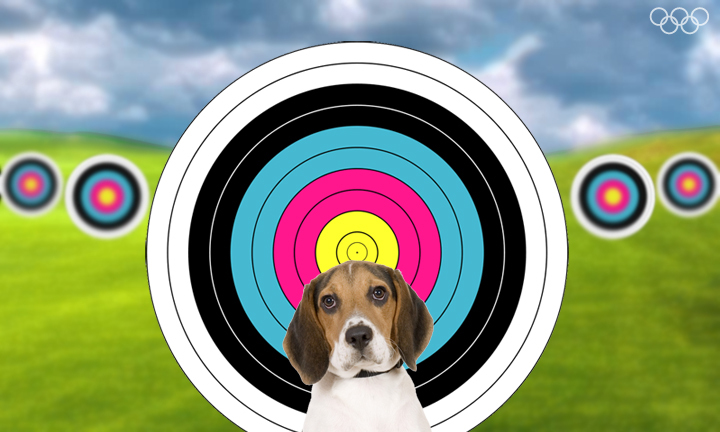 Disclaimer: No dogs or any other animals of prey were harmed in the Photoshopping of these images. Sumhow Katie, you look very at ease behind that bow! Excellent shot! Oh Katie! Yous is a natural! Is yous going to try out for the sequel to the hunger games? That little woofie looks so sweet and innocent...bwahahahaaa! such a multitalented kitty you are! So, what do you call it if not bullseye? You amaze me Katie with your abilities! I'd like to learn archery - can you catch moths that way? Wow what incredible aim. I bet you can have just about anything you want for dinner with that arrow. 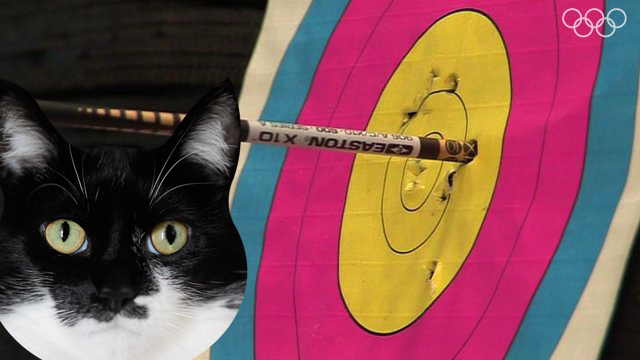 Katie, you are one multi-talented kitty. 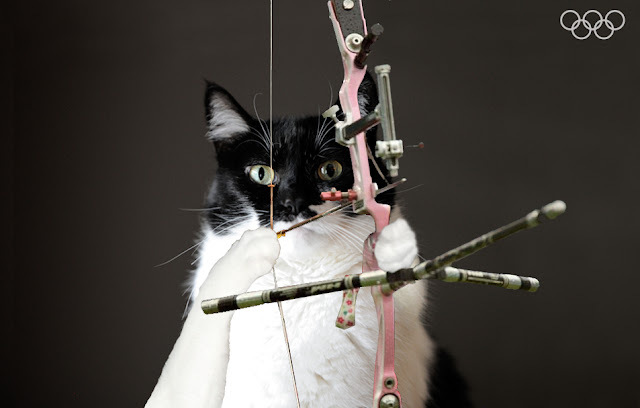 We are amazed at your prowess with the bow. What a sharpshooter you are! We love the pink bow. Of COURSE you would have a pink bow. Did you know that goats, while not meat eaters, can see 240° around? Hahaha, what a great and fun pictures! I'm glad no doggies are harmed! It was a joke, right? I can't even bear to look at poor little Fido there!! Happy World Cat Day... but then, how is that different than every other day? Very nice pink bow you have there, Katie. Is it safe to come out now? Have you put that bow and arrow down yet? Looks right on target to me Katie! Happy World Cat Day Glorgirly and Katie! We bet Katie wins many gold medals. Nothing better than a girl and her bow. Yoo R a troo Olympiun. Just don't git cawt hitting the nip beefore yer blud test. Katie, we never thought we would say this....but we actually feel sorry for that woofie. Katie, you are quite the athlete! I think you should have put an apple on Fido's head. Good shooting Katie! Fido is too trusting.